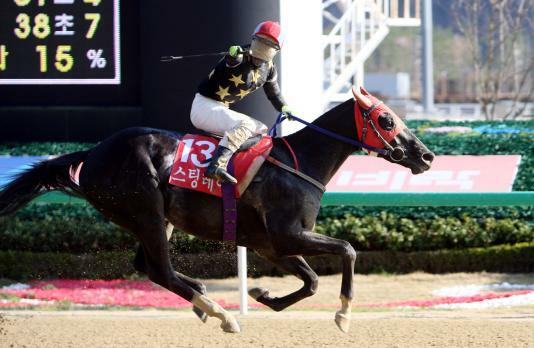 Yeongcheon Ace was the winner of the 2015 Korean Derby at Seoul Racecourse on Sunday. The second-favourite secured victory by two lengths to ensure that no horse will sweep the Triple Crown this year with KRA Cup Mile victor Rafale ending in 3rd. Yeongcheon Ace is the third consecutive Korean Derby winner to have been sired by Menifee following the fillies Speedy First in 2013 and Queen’s Blade in 2014. He is also the 6th horse from Busan to win the Derby from the 8 editions that have taken place since horses from that track became eligible. 1. Yeongcheon Ace (Choi Si Dae) – Away steadily and sat towards the back until they entered the home straight. He closed strongly and took the lead inside the final furlong to win by two lengths, going away. 4.8 to win, 1,7 to show. The Korean Oaks will be run at Busan on June 21 while the final leg of the Triple Crown is the Minister’s Cup, back at Seoul on July 19. Yeongcheon Ace came through with a powerful finish to win the 2015 Korean Derby at Seoul Racecourse this afternoon. Third in the KRA Cup Mile, the extra furlong proved all the difference as Yeongcheon Ace swept past the front running Daegunhwang in the final furlong and went on for a 2-length victory from Triple Nine and Cup Mile winner Rafale. 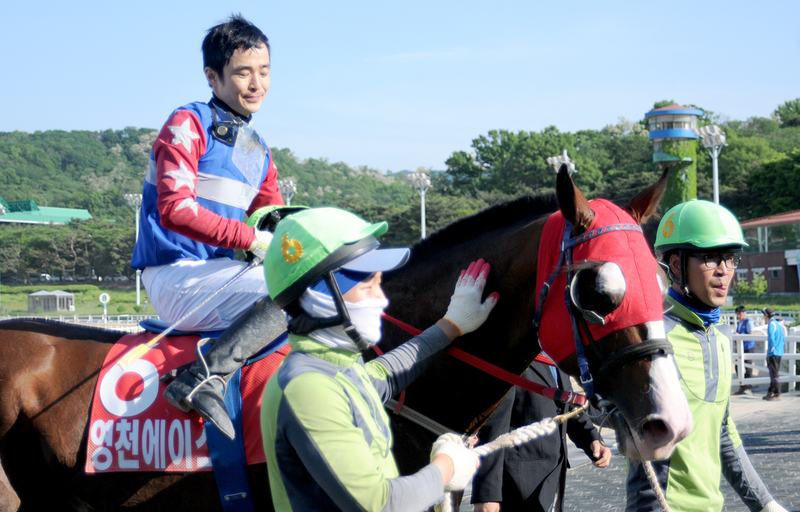 It was another big race win for jockey Choi Si Dae and yet another Classic winner from Busan. 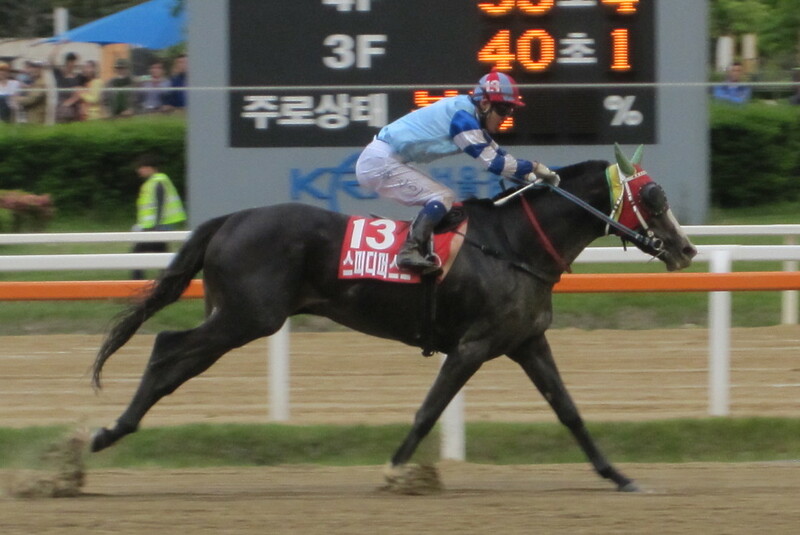 Daegunhwang was Seoul’s best finisher, battling on for 4th ahead of pre-race favourite, Doraon Hyeonpyo. The 18th running of the Korean Derby takes place at Seoul Racecourse on Sunday afternoon. Eight horses from Busan, including the KRA Cup Mile winner Rafale take on five from Seoul in the second leg of the 2015 Korean Triple Crown. If you’ve never been before, get down to Seoul Racecourse for this one. Although the Derby is the feature, it is one of ten races with the first at 10:50 and the last at 18:00. The Keeneland Cup is another big race on the day while K-Pop is provided by “Mamamoo”. A really quick finisher, he flew home in the Cup Mile to just be edged into 4th. He is a winner over 1800M already and is likely to go to the back early and try to close. Trainer Kim Young Kwan won the Derby in 2009, 2013 and 2014 and there is a real chance here of Masa Tanaka becoming the second foreign jockey to win the race. Seoul’s great hope. After a second place on his debut, he’s won five in a row generally from the front and without coming under any real pressure. He should be close to the early pace and is going to finally be subjected to a stern examination here. So far there is nothing to suggest he isn’t up to it and failure to at least place will be very disappointing. Another highly promising one from Seoul. He was a winner over 1700M last time out in a decent time beating both Seonbong and Smart Time in the process. He has raced close to the front on most starts – although he has had little to stop him doing that, has plenty of potential and may sneak into the money. Jockey Moon Se Young won the Derby in 2012 on Jigeum I Sungan while trainer Lee Shin Young would become the first female Derby winner. He and Rafale exchanged Champion Juvenile races last year and he was then overhauled in the closing stages of the Cup Mile by the same horse having hit the front three furlongs out. He won a slow mile race the time before that but hasn’t been tried at this distance. He will probably try to take the early initiative and with the home straight at Seoul generally being less taxing than at Busan, he may well hold on. The second string from the Kim Young Kwan stable didn’t run in the Cup Mile but comes in here after four consecutive wins, the most recent two of which were over a mile. He also has a quick finish and will try to come from just off the pace. 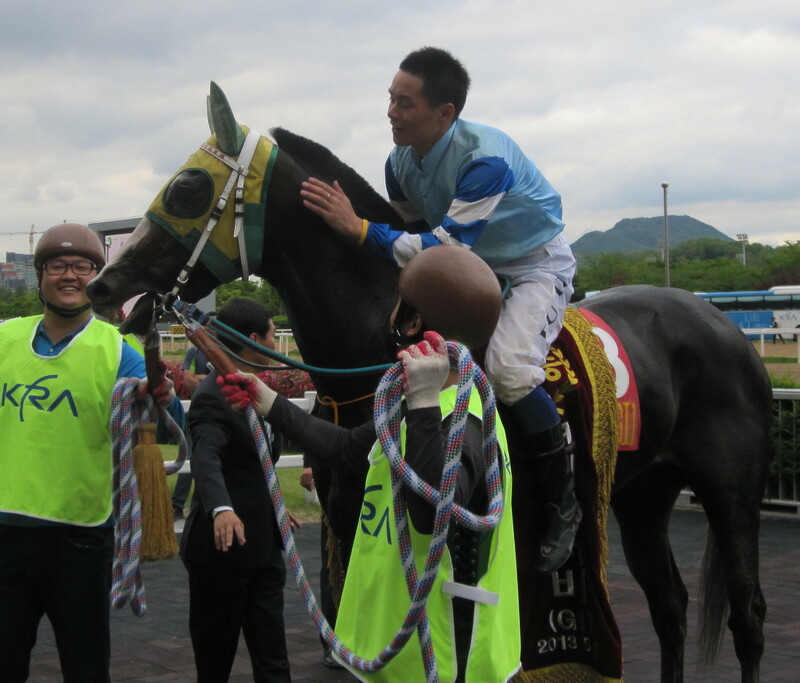 Jockey Oh Kyoung Hoan, now based at Busan, won the Derby on Gwangyajeil in 2011. Along with Yeonggwanguitaepung, this is the other noted closer in the race. He came from off the pace to finish 3rd in the Cup Mile and has never been worse than 3rd in eight career starts. The distance won’t be a problem – he beat Rafale over 1900M in March and he must be strongly considered. Jockey Choi Si Dae won last year’s President’s Cup and Grand Prix at Seoul but is yet to win the Derby. He has plenty of speed, putting in some really quick times but is yet to be tried at further than 1400M. As such, others will be favoured although he did beat Seonbong over 1300M earlier this year. His only shot is perhaps to go out quickly and try to hold on so expect to see his jockey try to get to the front before the first turn. Park Eul Woon is yet to win a Graded race. One of two fillies in the race, she didn’t run in the Cup mile and her saddle slipped on her only try at further than 1400M so far. She won at that distance last month and is likely to try to take up a position just behind the early leaders. She won’t be among the favourites as the others are far more proven but it is worth noting that fillies do have an excellent record in this race and have won the last two renewals. Well-fancied for the Cup Mile, he was a real disappointment, never getting into the right position and never travelling well ending 8th of 11. He had been an impressive winner over the same distance the time before A disappointment in the Cup Mile, running 8th of 11 when well-fancied, he had been an impressive winner over the same distance the time before. If he can get to the front entering the home straight, he has a chance but he won’t be among the favourites this time. Joe Fujii won the 2013 Derby on Speedy First. The KRA Cup Mile winner will no doubt have plenty of support in the Derby too. He won a class 2 race at this distance in January although Doraon Hyeonpyo beat him on his only previous visit to Seoul and he also finished behind Yeongcheon Ace over 1900M in March. Others were finishing faster in the Cup Mile but he got the job done. He won’t want to lead but neither will he want to be too far away and if he finds a run in the home straight, he can win this. 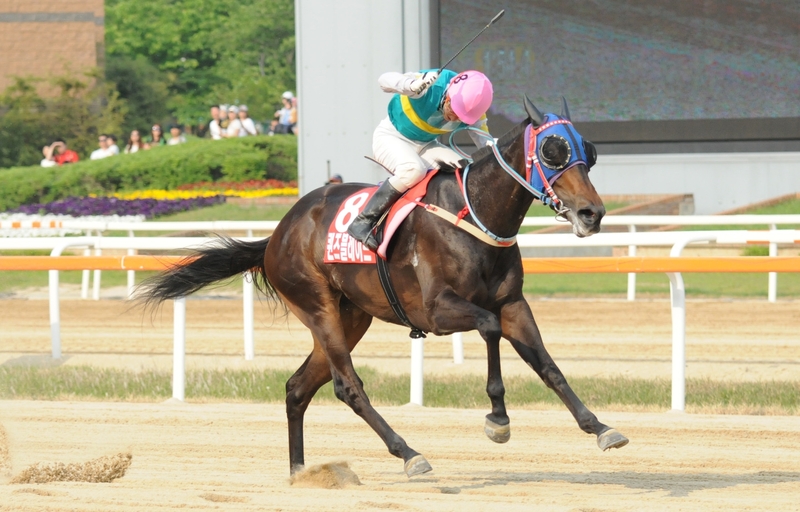 You Hyun Myung is yet to win the Derby but he has won the Grand Prix Stakes at Seoul. The other filly in the race, she will one of the rank outsiders.A filly, she will be an outsider here. She was second to her talented stablemate Meni Money in the Sports Seoul Cup but was 4th on her only try around two turns so far with both New White Socks and Seonbong beating her and this will be a tough ask. He was just beaten a neck by New White Socks last time out over 1700M having led at one stage. He will probably settle in the middle of the pack and should stay on. He will not be among the favourites but is certainly capable of putting in a good performance. 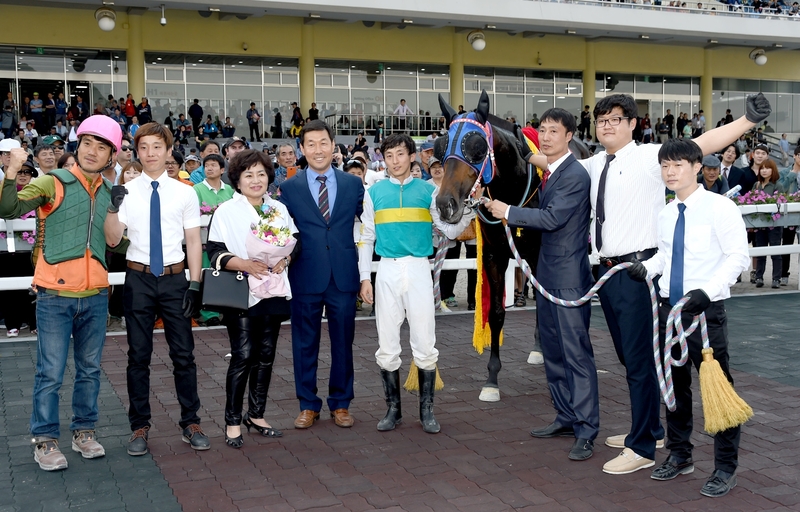 Jockey Lee Joon Chel’s biggest win to date came in the Owners’ Cup in March this year. One of the biggest days of the year is almost upon us. The 2015 Korean Derby will be run at Seoul Racecourse on Sunday May 17. The Grand Prix has the prestige while the new Asia Challenge Cup has the international visitors but the Derby is still the Derby. Eight are scheduled to make the trip up from Busan headed of course by Rafale. He won the first leg of the Triple Crown, the KRA Cup Mile (Korean 2000 Guineas) at his home track last month. The horses who finished 2nd to 4th in the Cup Mile will also be there. Connections of Doraon Hyeonpyo, Yeongcheon Ace and Yeonggwanguitaepung will be hoping that the additional furlong of the Derby will make all the difference. Unlike for the Cup Mile last month, Seoul looks set to at least provide a challenge for the visitors with the exciting Daegunhwang perhaps best placed to keep the silverware in the capital. Two fillies are entered; Smart Time from Seoul and Yeongung Bolt (she of saddle-slipping fame) from Busan. The KRA Cup Mile winner will no doubt have plenty of support in the Derby too. He won a class 2 race at this distance in January. Others were finishing faster in the Cup Mile but he got the job done. He won’t necessarily want to lead but he will want to be close. Last year’s champion juvenile was overhauled in the closing stages of the Cup Mile by Rafale having hit the front three furlongs out. He won a slow mile race the time before that but hasn’t been tried at this distance. Seoul’s great hope. After a second on his debut, he’s won five in a row generally from the front and without coming under any real pressure. It is going to be very interesting to see what he can do when subjected to a proper examination. This one likes to come from off the pace which he did to run third in the Cup Mile. Has never been worse than 3rd in eight career starts and will have no trouble with the distance. Another highly promising one from Seoul. He was a winner over 1700M last time out in a decent time and has plenty of potential. A disappointment in the Cup Mile, running 8th of 11 when well-fancied, he had been an impressive winner over the same distance the time before. He’ll get another chance here. He didn’t go in the Cjup Mile but comes in here after four consecutive wins, the most recent two of which were over a mile. A very quick finisher, he is from the Kim Young Kwan stable. This is another quick finisher, he flew home in the Cup Mile to just be edged into 4th, he was a winner over 1800M the time before and has a real chance here. A filly, she will be an outsider here. Second in the Sports Seoul Cup but 4th on her only try around two turns so far, this will be a tough ask. The other filly, her saddle slipped on her only try at a mile so far. She returned to win over 1400M. Likely to be showing towards the front early but she probably won’t be among the favourites. Fillies do have an excellent record in this race recently though. Just beaten a neck by New White Socks last time out over 1700M, he was leading at one stage and is certainly capable of putting in a good performance. He showed the way for much of the Cup Mile but didn’t stay on, fading to 6th. The distance will again be the big question mark here. Plenty of speed, putting in some really quick times but is yet to be tried at further than 1400M. As such, others will be favoured. We will have another detailed preview once final declarations have been made, jockey bookings have been confirmed and all horses have arrived in Seoul. This has the makings of a very interesting Derby. A Triple Crown may on the cards in the United States but any hope we may have had of getting our own in Korea this year vanished in the Seoul sunshine this afternoon as filly Queen’s Blade crushed all-comers in the Korean Derby. Most morning lines had KRA Cup Mile winner Cheongnyeong Bisang down as the likely winner so it was mildly surprising to see punters send Queens Blade, who had finished 5th in that race, off as the slight favourite for this, the 2nd leg of the Triple Crown. They were very quickly vindicated. Raon Morris, 4th in that Cup Mile in Busan last month, set the pace but Queen’s Blade went right with him. Cheongnyong Bisang tried to close in the home straight but he had too much to do. Queen’s Blade was out of sight. The distance on the line was 10 lengths. It may as well have been 20 such was her superiority today. Jeongsang Bima, a 40/1 outsider, was the only one who did close semi-successfully, coming home 2nd while Raon Morris stayed on for 3rd, one place ahead of Cheongnyong Bisang. Peter Wolsley’s Jungle Jim managed an unlikely 5th but it was a generally depressing race for the foreign contingent; Darryll Holland the highest finisher among the 5 foreign jockeys in the race, coming 6th on Wild Rush. Queen’s Blade is a half-sister to 2008 Korean Oaks winner Jeolho Chance and was today recording her 5th win from 9 career starts. She looks set to be heavy favourite to follow her big sister in the Oaks in Busan in August. For jockey Kim Yong Geun, it was just a second Stakes race win and his first Classic. For the remarkable trainer Kim Young Kwan, however, it was a third Korean Derby win. All three of those have been with fillies with today’s win adding to those of Sangseung Ilro in 2009 and Speedy First a year ago. It’s also another classic win for Busan means the southern track leads Seoul by 4 Derby victories to 3 since competition between the two began in 2008. While Queen’s Blade and the other fillies today have the Oaks to attend to, the rest of the best of the 3-year-old crop won’t reassemble until the final leg of the Triple Crown, the Minister’s Cup at Seoul in October. How many of today’s field make it there is open to debate. A number of high-profile names didn’t make it into the starting gate today. Gilbert, who placed 2nd in the Cup Mile and the promising Yeonggwanguichampion both suffered injuries after the Cup Mile. Meanwhile Peter Wolsley’s best 3-year-old Never Seen Before failed his barrier trial last week and wasn’t allowed to run. So dominant was Queen’s Blade today though that it is unlikely any of those three would have come any closer to her than the fourteen she left strung across the track in her wake today. The Queen from Busan, Queen’s Blade is our 2014 Korean Derby Champion. Speedy First (Menifee) came in to the race off 4 consecutive wins and was sent off the 4/1 second favourite behind Sting Ray (Forest Camp), who punters had backed into odds-on. Outsiders Heungnyong Bisang (Ft.Stockton) and Titan (Creek Cat) made the early pace but the pack was bunched tightly together as they entered the final corner. Turning into the home straight they fanned out across the track but it still looked anyone’s race until Joe Fujii got to work on Speedy First a furlong and a half out. The pair sped away from the rest and never looked back. The margin of victory on the line was 2 lengths with 47/1 chance Unhae (Ingrandire) finishing 2nd and Major King (Pico Central) 3rd. Sting Ray never looked likely to add the second jewel in the Triple Crown to the first and trailed home 6th. Aussie trainer Peter Wolsley’s Amell’s Atom (Menifee) picked up some prize money by finishing 5th, however, there was disappointment for British jockey Darryll Holland who ended in 12th place on Fantastic Jazz (Menifee). Lee Shin Young, the first female trainer to have a runner in the Derby, saw both her entrants struggle with Titan in 13th and Awesome Tiger (Exploit) disqualified. 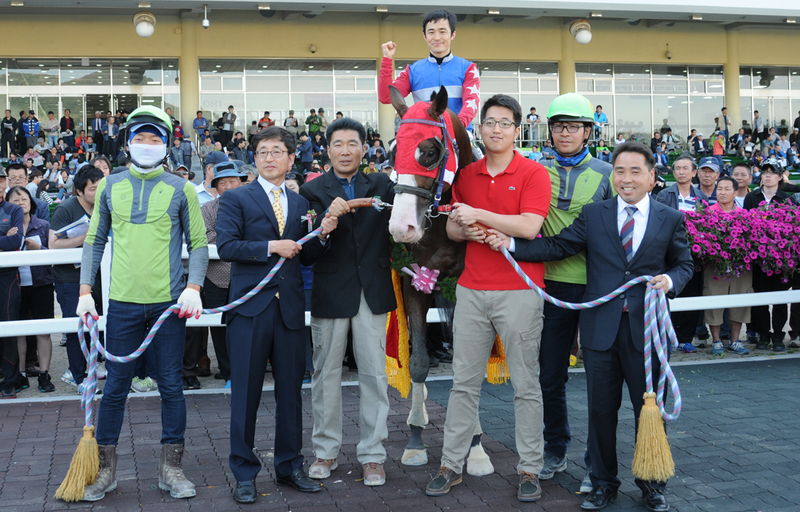 For jockey Joe Fujii, it was the 60th winner of what has been a quite remarkable 11 months in Korea. The 29-year old won the Grand Prix Stakes on another filly, Gamdonguibada, last December becoming the first foreign jockey to do so and today he completed a unique double by achieving the distinction of being the first foreigner to win the Derby. He has now won 2 out Korea’s 3 richest races. Fujii’s license was recently extended until September and his reputation among punters is such that he is well on the way to taking on Toshio Uchida’s title of the most popular Japanese man in Korea. 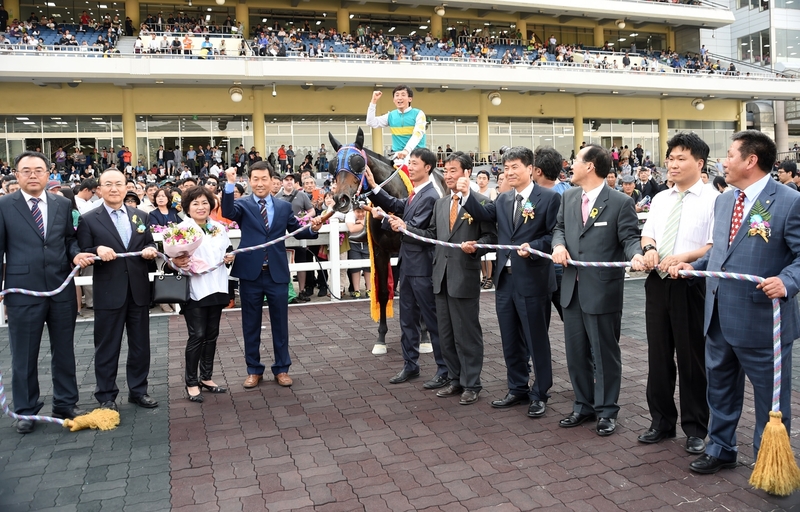 Speedy First’s win also firmly cemented Busan trainer Kim Young Kwan as the nation’s best. 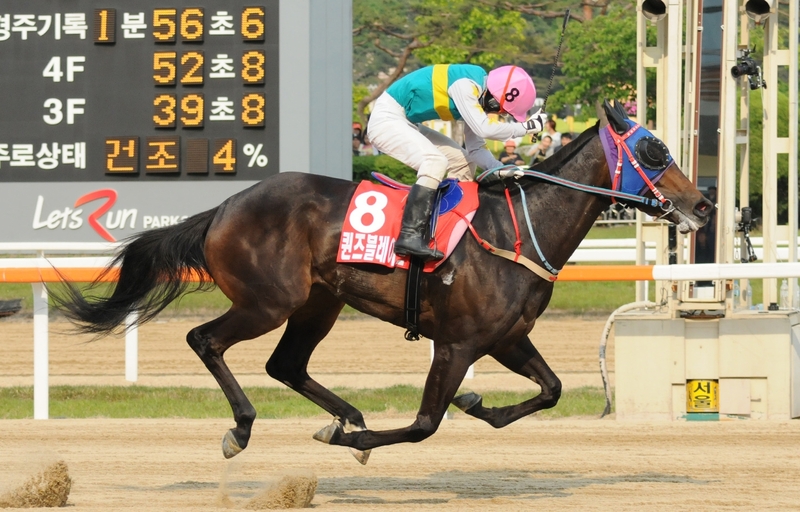 This was his 2nd Derby, following Sangseung Ilro’s 2009 triumph. 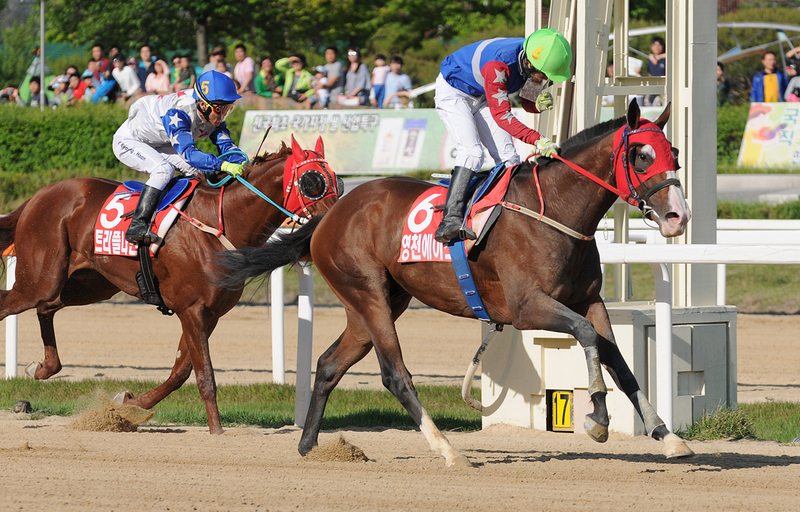 In more general terms, Busan horses once again got the better of their Seoul counterparts in a big race. So just a few hours after a Triple Crown hope went down in the US in the shape of Orb, so Sting Ray’s hopes of emulating J.S.Hold in Korea have gone. Never mind, today we saw a new star emerge on to the scene. Speedy First will automatically become favourite for the Korean Oaks, which will be held at Busan in August and then if all goes well, we should see her back at Seoul in October when the cream of this year’s generation reconvene for the Minister’s Cup, the final leg of the Triple Crown. There is a lot to look forward to. It’s a massive weekend of racing at Seoul. The JRA Trophy gets things underway on Saturday afternoon and then on Sunday, it’s the big one. A full field of 16 will line up for the Korean Derby. They are headed by KRA Cup Mile winner Sting Ray, who travels up to the capital looking to win the second-leg of the 2013 Triple Crown. Three foreign jockeys have rides. Yukio Abe doesn’t look to have much chance on Last Mudae but Joe Fujii on Speedy First and Darryll Holland on Fantastic Jazz both look to have claims. Meanwhile, Australian trainer Peter Wolsley seeks to win his first Korean Classic race with Amell’s Atom. With more wins behind them as a group than any previous Korean Derby, it is set to be a very interesting race. K-Pop girl group Sistar will be on hand to provide pre-race entertainment. Promising colt who won at class 3 over the distance last time out although will need to find more improvement still here. One of a pair of runners giving Korea’s first female trainer Lee Shin Young her first Derby entrants. Only debuting in February, there is still something of an unknown quantity about her, however, everything she’s been asked to do she has done very well including a win over the distance at class 4 last start. The KRA Cup Mile winner and therefore the likely favourite especially as the increased distance will also be in his favour – he’s already won over 1900 metres. If he runs anything like his best, he will be very difficult to beat. Last year’s champion Juvenile has shown little this term. He was heavily beaten in the Cup Mile and there is little to recommend him here. A well-beaten 3rd behind Brig last time out and it’s hard to suggest backing him to reverse that. Has consistently placed but in weaker company. Over the winter he was one of the Derby favourites but while he began the year with a class 4 win over the distance, he form has dipped culminating in a poor run in the Cup Mile. Will need a lot of improvement if he is to compete here. The mount of last year’s winning jockey Moon Se Young skipped the Cup Mile and comes into the race with back to back class 3 wins over the distance to his name. He won’t be favourite but he has a chance. Another who comes into the race after consecutive wins at 1800 metres albeit at a slightly lower lever. A place may be the most realistic hope. Has won at Busan over 1800 metres in a fast time. Stepped up to class 2 last time and was finished a creditable, if uninspring, 3rd. Not one of the favourites but could cause some problems. One of few in the field to have made it up to class 2, Lee Shin Young’s second runner is a half-brother of last year’s Derby runner-up Nobel Pokpung. He hasn’t actually won at higher than class 4. Always there or thereabouts, he usually finds one or two just a little bit quicker and that will probably be the case here too. Like favourite Sting Ray, K Tap’s dam also won the JRA Trophy. K Tap himself hasn’t yet run as a 3-year old, his last appearance being his 2nd place in the Breeders’ Cup last November. Prior to the he won the Gwacheon Mayor’s Stakes. He was very talented as a 2-year-old but it is difficult to back him after such a long lay-off when there are so many capable opponents. He was 3rd over the distance in a class 2 race last time ending a run of 4 consecutive wins. A real talent, he has a strong chance to give his sire Pico Central a Derby win in the year of his untimely death. Cracking little filly who has won her last 4 starts. Untested at distances greater than 1500 metres, the Oaks in August may be a more realistic target, however, while a win may be asking too much, she shouldn’t be discounted. Still at class 4 after 13 starts, there seems little to suggest that he is going to rectify that here. 4th in the KRA Cup Mile, he dead-heated for victory in his last start. A talented horse, he has an outside chance of giving Aussie Peter Wolsley his first Derby winner. 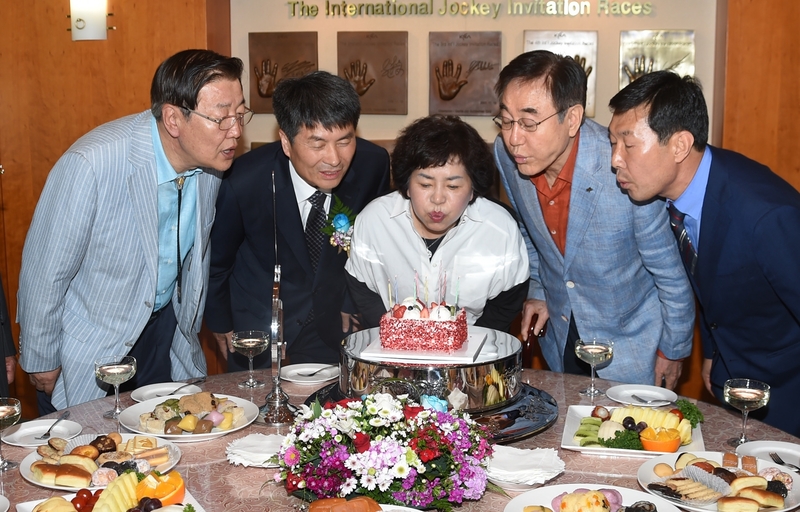 Champion jockey Jo Sung Gon gives up a weekend of rides at Busan to partner him, which is a good sign. 3rd in the KRA Cup Mile, the half-brother of 2008 Korean Derby winner Ebony Storm has since been moved from Peter Wolsley’s stable to that of Kim Young Kwan. Hasn’t won at further than 1300 metres but looks to have a lot more to give. Darryll Holland, who was second on Raon Boss in the KRA Cup Mile, gets his 1st Korean Derby ride.